Location in close vicinity of DC Neptun, distance to Cape Šilo approx 2 NM to the northwest. The position is marked with an anchor rope and mooring buoy. Dive into the blue, to a 14 meter-deep rock, then to the left hand side around the reef to the max depth of 28 m. The location is rich with small white-fleshed fish, octopuses and groupers, as well as many species of sea snails. This is a less demanding location for AOWD category minimum or OWD plus Deep Diver specialty. There are no strong sea currents, diving is possible at any hour during daytime. This position is located at the transition point from Vinodolski kanal to Velebitski kanal along the eastern shore of the island of Krk, 7 NM from DC Neptun. The dive point is under high cliffs, next to the very coast. Diving takes place along the cliff wall down to 40 meters deep (not yet the sea bottom). The wall is drilled with holes and cracks and extremely rich in flora and fauna. Diving is two-directional. With favourable weather conditions, the boat is moored next to the rocks. Moderate sea currents. The location is better suited for morning dives due to sun position. This is a challenging location for AOWD experienced divers as minimum. This location is next to Cape Glavina in Vinodolski kanal, 5.5 NM away from DC Neptun. The dive point is 50 m away from the shore. 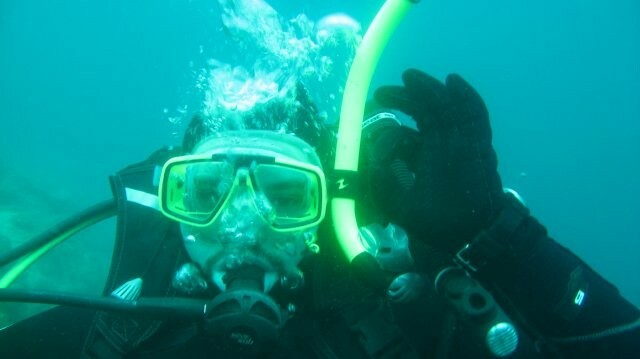 There is option to dive from the position Glavina along the coast and swim across sand or directly dive into the blue with anchor rope, 25 m deep and then around two towers down to 40 m (not the bottom). 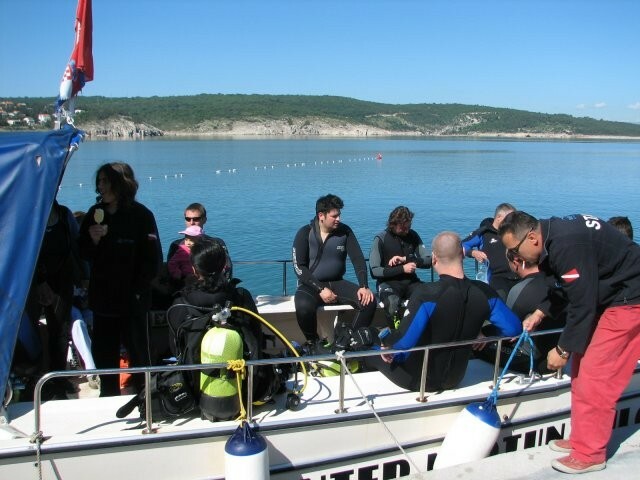 The location is ideally suited for morning and early-afternoon diving. Rich in flora and fauna, large schools of two-banded sea bream and gilthead can be seen during cold weather, no significant currents. 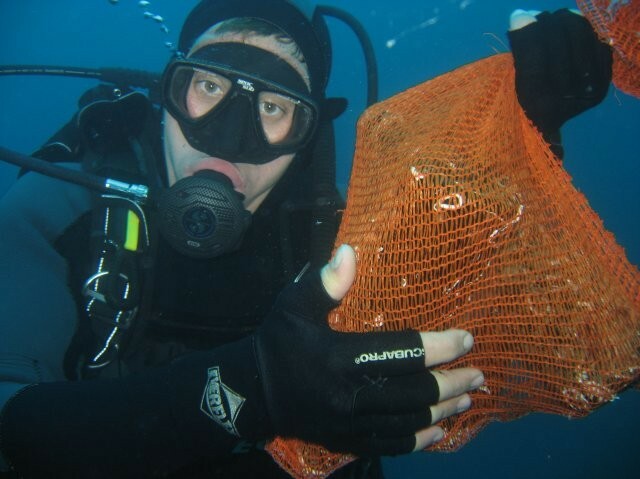 Challenging position for experienced scuba divers, AOWD category minimum. The position in front of the Diving Club Neptun. Sea entry point is at a pebble beach in front of a concrete quay, 20 m from the centre. The area is fenced with signalling buoys and ropes making access to boats impossible and thus guaranteeing total safety to divers. Full logistics on the shore. At 5-9 m, the bottom is mostly sandy, ideally suited for scuba diving lessons; further away, from 7-11 m deep there is a wall going down to 25 m full of holes and cracks, rich in flora and fauna. This position is rich with domesticated schools of fish used to feeding. At 10, 15 and 18 m, there are three smaller wrecks, finely overgrown with plants. Old Greek freight ship, sunk way back in 1968 after crashing on a rock in the close vicinity of the Klimno Cove. The length of the ship is 60 m, and max depth is 31 m. The bow mast is at 8 m, stern mast at 12 m, bow at 17, bridge at 21 and propeller at 31 m. Visibility is mostly at medium range, largely depending on weather conditions, and can be severely diminished even due to a bad weather of lesser extent. Weak currents are possible. This position enables extraordinary dives, both for beginners and experienced scuba divers. The starting point of the reef is at 14 m, and max depth is 35 m. The bottom is a combination of sand and rocks. The dive begins with a 14 m deep wall, followed by a 20 m long sand plateau and then again follows a wall with shadowy protuberances down to 35 m.
Your dive begins on the left side of the tiny peninsula, starting from a small rocky beach and simply following the right wall. For most of its length, the wall reaches 18 m deep, immediately under the entrance to a small cave. On your return, try finding a low passage way 3 m below surface which would simply be a pity not to see. This position is immediately near a cove in front of the town of Vrbnik on the island of Krk. The starting dive point is above the very entrance to a 15 m deep cave; the surface in front of the cave is covered with sand, while the cave bottom consists of silt and sand mixture and one should enter carefully so as not to cause severe visibility reduction. The top of the reef is only 3 m below sea surface, and one can go down to 40 m deep, wile at 9 m there is a 5 m long tunnel which is passable, even for two divers, side-by-side. It is essential to emphasize that this tunnel not only serves as a passageway, but it takes one’s breath away at the very gate with beautiful plant life and small caves where conger eels and groupers frequently reside. An extraordinary location with two reefs 25 m away from each other. The first one, protruding above sea surface, is a position where one can dive down to 25 m, filled with various cuts, abundant with first-class fishes, crabs, snails and octopuses. The other reef, 25 m away from the first one, is also a very interesting position. It begins at 2 m and stretches down to 35 m.
A beautiful location, particularly for the fans of diving “into the blue”, since the peak of one of the two “cathedrals” is at 25 m of depth. As we have already pointed out, there are two reefs at this position. The location is wealthy in sea life (fish, crabs, snails, octopuses), and with any luck, one can see the well known “langouste”. The maximum depth here is 40 m. Underwater lamp is mandatory part of the equipment due to the conditions on site. Light currents are possible while visibility is good for the most part.